I've stuck a lot of things on my face at CES 2018. Some good, like the HTC Vive Pro; some less impressive, like, well, most of the AR headsets and glasses I wore. But Vuzix is one of the good ones, delivering the closest thing to the Google Glass promise we've seen so far. The Vuzix Blade is a slight improvement on the Blade 3000, which I tried in the very same room in Vegas one year before. But the buzz around Vuzix this time has been much, much louder. Apparently you stick Alexa or Google Assistant in anything and everyone goes nuts. But I'm glad for Vuzix that it's attracted so much attention. It's been building AR glasses since the 90s, all for the enterprise market. But the Vuzix Blade is made with the everybody in mind. It's not entirely consumer-facing, but Vuzix reckons it will have some broader appeal out the door. Yes, Alexa is one of the features that will give it that appeal, but things like messages, turn-by-turn instructions and location-based alerts (think live Yelp reviews) will too. Vuzix has an open platform that developers will be able to build for. I even played a game on them. Like Google's foray into AR, the Vuzix Blade projects a small window onto one of the lenses, though it's much more prominently positioned than on Glass. There's also an 8MP camera on the front and 4GB of storage, while the software is a custom Android build. But those specs aren't what make Vuzix so interesting; it's the fact they don't look hideously ugly or obtrusive. We're not talking about a pair of Oakley's here, but they're not too far away from a regular pair of specs. "This is fashion brought to you by the very best smartglass engineers in the world," joked Vuzix COO Paul Boris, who said Vuzix would be interested in partnering with fashion brands like Fossil. "We can put those guts into any form factor, generally speaking, and if someone in that space said lets team up - and some of those conversations are starting now - why not?" The other thing that impressed me was how good the display looked. Not only was it easy to ready every notification, but photos viewed on the glasses looked crisp and vibrant. As for battery life, expect anything between 2 and 12 hours, depending on the intensity of use. They're also - unlike Magic Leap, which runs on a connected pod - totally standalone. You'll be able to connect them to Wi-Fi, and Alexa is actually installed on the specs. The addition of Alexa also opens a better way of interacting with the glasses. There's a touchpad on the side, but voice control is much better suited for something we'll be wearing on our face. 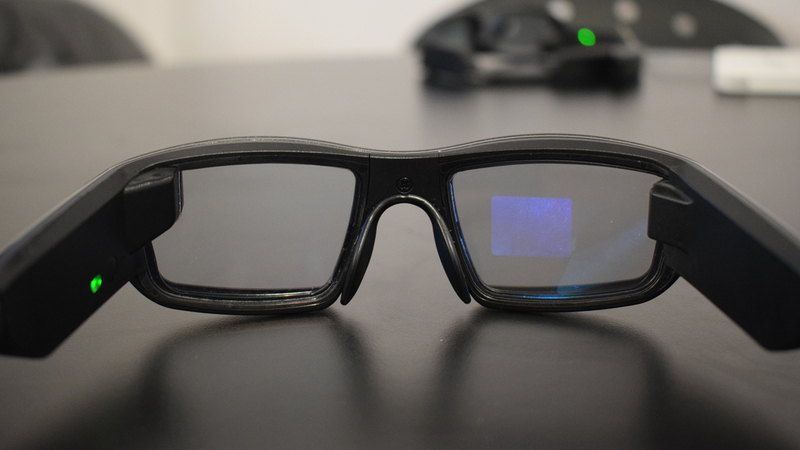 Vuzix is selling the glasses as a dev kit for $1,800 right now, but Boris said he thinks the glasses will cost around $1,000 when they're made generally available. Don't expect them to be widely advertised in the way Snap Spectacles were. Boris thinks we're still five years away from cramming this tech into a svelte pair of normal glasses, but broader adoption from the enterprise space, which too wants glasses that are easier on the eye, will lead to more mainstream appeal. "Those companies were telling us, 'We really like the M300' - and this is an actual direct quote from a very large retailer - 'but in stores where staff interact with customers, we don't want to scare the little children.''" The Blade look much more like a regular pair of glasses than the M300, which are heavily targeted towards industry. "We think the consumer market is going to be pulled along by the enterprise market". It feels like AR glasses are nearly at the point of mainstream adoption, and I expect Vuzix's expertise is attracting a lot of attention from major consumer tech players. The hardware is edging closer to the AR we were promised, now we just need to start seeing compelling software that goes hand in hand.